Farm Pathways recently hosted a very successful National Young Farmers Coalition Regional Land Access Innovation Training. This all-day event was the first in the Southeast and was held at the Mountain Horticultural Crops Research & Extension Center in Mills River on Wednesday, March 8th, 2017. 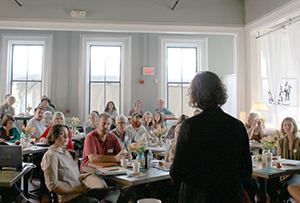 This training was a full-day, in-person workshop designed for land trust staff and other regional conservation professionals who are involved in farmland protection projects and committed to supporting farmers. Attendees of the March 8th training learned about the innovative tools and strategies being used by land trusts around the country to keep farmland affordable and accessible to farmers. The training featured presentations on farmers’ land access needs and challenges, affordability provisions in easements, ground leases, legal considerations, funding, and more. These trainings provide an opportunity for participants to learn from a small group of mentors – including land trust staff, service providers, lawyers, and appraisers – about innovative strategies and tools being used to ensure farmland stays in production and in the hands of farmers. Along with presentations from experts, trainings include ample time for discussion and input from participants to facilitate collaborative learning. Lead Mentor | Equity Trust is a national organization devoted to helping farmers achieve long-term and affordable access to farmland. Since the mid-1990s, Equity Trust has been a pioneer both in developing tools for addressing this need and in educating the land trust community about the issue. With a mission to “change the way people think about and hold property,” they have worked with the land trust and farmer communities to create some of the most innovative affordable farm partnerships in the country. In 2014, Equity Trust launched an exciting regional program to promote and finance farm affordability in the Hudson Valley of New York State. Learn more at equitytrust.org. If you are interested in holding this training in your region for land trusts, contact the National Young Farmers Coalitions’ Land Access Program Director. NYFC executive director, Lindsey Lusher Shute, addresses attendees of the 2014 Land Access Innovations Training. Access to farmland remains one of the biggest barriers that beginning farmers face, but innovation and leadership demonstrated by a number of land trusts has opened up new possibilities for helping these farmers succeed. NYFC believes that these groups have enormous potential to make farmland across the country more affordable and accessible for the next generation of farmers. Since 2014, the National Young Farmers Coalition (NYFC) has teamed up with experts in farmland conservation to offer a series of Land Access Innovations Trainings across the country, including regional trainings in California, Michigan and now North Carolina, and national trainings in Rhode Island and California. These intensive trainings are aimed at land trust staff and other conservation professionals with a high degree of commitment to protecting working farms and keeping land affordable for farmers. More information about NYFC’s Land Access Campaign and Innovations Trainings, can be found here. NYFC also works with local partners to offer in-depth trainings for farmers on the process of partnering with a land trust to access land along with information on writing strong leases, assessing financial options, and other relevant steps in the land access process.